For the first time after 2008, residential apartments sold in all four quarters of 2016 were higher than new units launched. Through 1Q2017 too, this trend continued across India, and is expected to last for another couple of quarters even as RERA kicks in and businesses prepare for the implementation of the GST – touted as independent India’s biggest taxation reform. 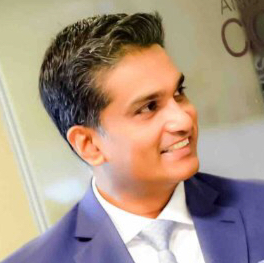 With traditional cash flows during a project’s life cycle changing due to an evolved policy framework and compliance, developers are busy changing their business models too. This, coupled with slower sales in recent years, has led to the ongoing slowdown in new unit launches. The industry is also witnessing consolidation during recent quarters, which is expected to continue in the coming years. 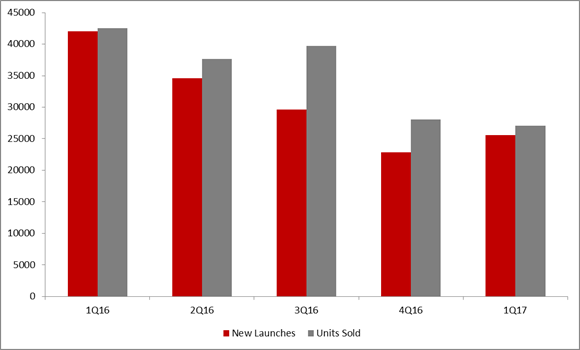 Comparing these five quarters, the number of units sold vis-à-vis number of new units launched was the highest in 3Q16 – when it exceeded new launches by more than 10,000 units at a pan-India level. In 4Q16, demonetization slowed down speculator activity and from then on, sales have been largely driven by end users. Developers have rediscovered the value of end users and have been right-sizing and right-pricing their offerings accordingly. What’s happening in the cities? At a city level, the difference between units sold to units launched is the starkest in Delhi-NCR. Interestingly, the trend is clear across all the metros – Delhi-NCR, Mumbai, Bangalore and Chennai while the difference is negligible in Kolkata. 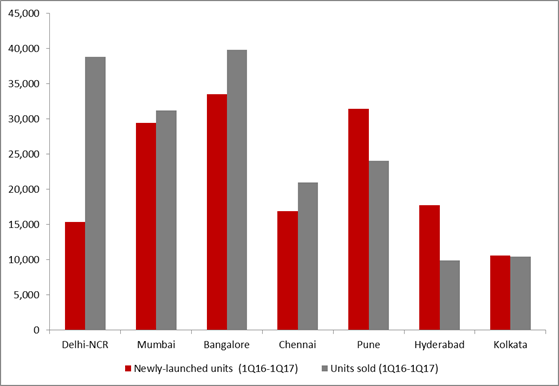 Although the number of new unit launches looks greater than units sold in both Pune and Hyderabad, a closer look reveals the true picture. In Pune, even as the units launched reduce marginally every quarter, these are largely situated in projects along the city’s fringe areas having smaller configurations. In Hyderabad, launches are expected to stabilise through 2017 because a significant increase in launches could lead to unsold inventory piling up. Both these markets are expected to align to the pan-India trend in one or two quarters. In 2008, it was the global financial crisis (GFC) that hit the developers. This time around, however, there is a new reality wherein developers are consciously trying to reduce inventory across cities by gradually reducing the number of launches and markets are maturing due to the emerging supply-demand realities as well as the changing policy framework.